I am sure many of you already know the name of famous online store called Born Pretty Store which sell jewelry, makeup, tools and many other fashion and beauty related products. Recently i got the chance to pick some lovely jewelry pieces from their store and i was really amazed to find out that they have wide range of accessories. 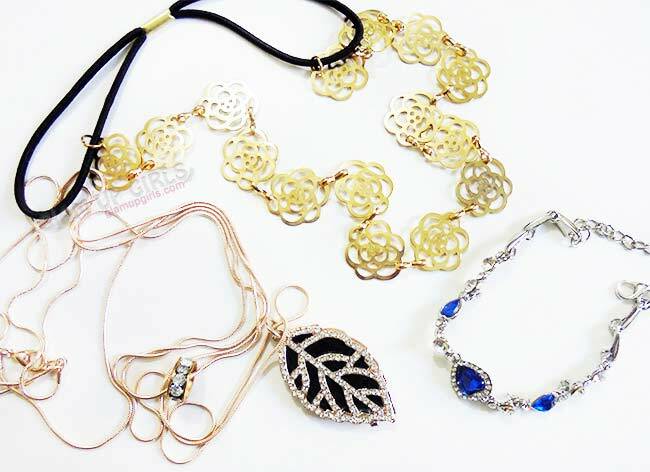 You can find all type of jewelry be it rings, necklace, earrings, bracelet, hair accessories or even body accessories. The best thing about this store is that it provide very budget friendly pieces with free shipping and that is something we cannot ignore. I have picked three jewelry pieces from this store and today i am going to share my picks and their review with you. It is long double chained pendent. 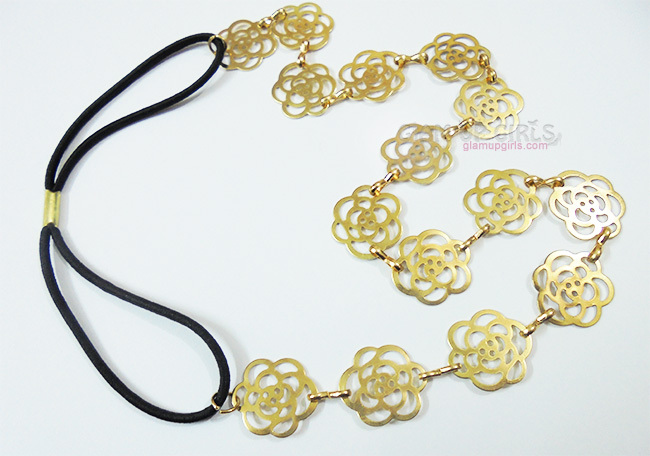 The chain is very beautiful and delicate which is in rose gold color. The materiel looks really good and fine which is easy to wear and doesn't stuck or irritate the skin behind the neck which is big plus for me. The one chain is bit longer then other and it has the leaf shape pendent. The leaf pendent is also double layered. the bottom layer is black painted with silver boundary. 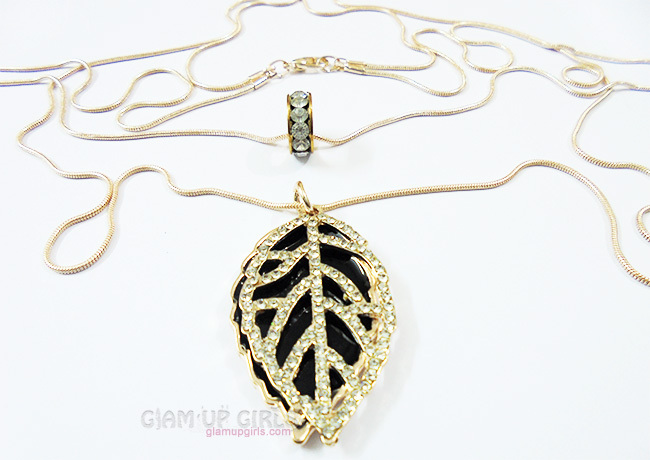 The top layer shows the veins of leaf and contains very fine rhinestone. The short chain have small ring pendent with rhinestones. The quality of both pendent is very good and the rhinestones are attached perfectly to their places so they don't come out easily. 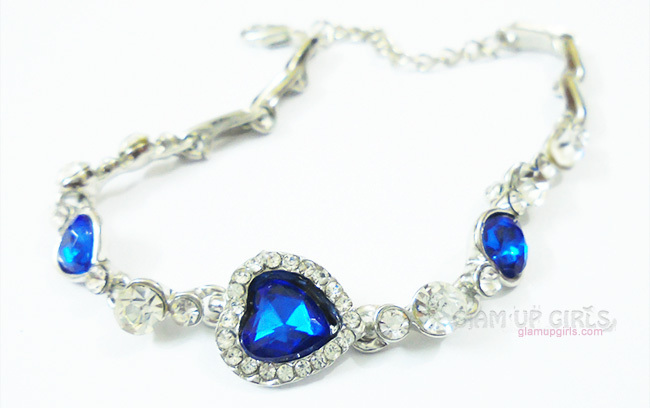 This bracelet is made of silver alloy which have three heart shape blue rhinestones and other silver white rhinestones. The materiel is really fine and feels very good comparing its price. The crystals are placed strongly to their places and hope fully they will not come easily. It has no part that can stuck to clothes or hairs and is comfortable to wear. This hair piece is really amazing. I was not sure how it will look in real but it impressed me. The fancy part is made of golden alloy which is very fine and there is no way it can be trouble for hairs. The materiel is of very good quality. It can be wore as hair band or head runner. It is circled with black elastic band to fit the head which is easily stretchable. Overall i am really impressed with the quality of these jewelry and for my surprise the package reached to me within 20 days which is remarkable to comparing other online stores. I would highly recommend everyone to buy from this store and you can avail 10% off on non discount products with coupon code CNVT10.